The Museum of Modern Art 's architectural history has been steeped in sleek, elegant modernity but its last couple of major expansions have been widely seen as rather bland and not in the forefront of contemporary architecture. 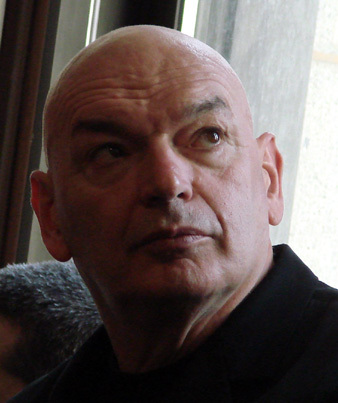 On November 14, 2007, Hines, the Houston-based development concern headed by Gerald D. Hines, announced that Jean Nouvel had designed a 75-story tower for it that will combine an expansion for the Museum of Modern Art in its base, a 100-room, "seven-star" hotel and 120 high-end residential condominium apartments. Hines had acquired the small plot of about 17,000 square feet at 53 West 53rd Street in January, 2007 for about $125 million. The L-shaped plot runs through the block to 54th Street where it is just to the west of the American Museum of Folk Art. Nouvel's design is quite breathtaking, bold and a bit bizarre. It is definitely not in context, which is not necessarily bad. Is it a deconstructed obelisk? Is it a hanger for a an ungainly spacecraft designed for a landing on Pluto? Is it a prickly 21st Century urban thorn? It does not conform to any known building style and that's just what New York City needs more of. A completely asymmetrical design, it has no traditional setbacks and tapers to a point. 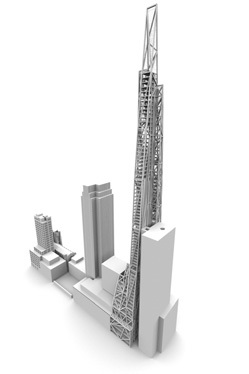 The press release did not indicate the building's height in feet and commentators on the Internet were euphoric about the design and especially about its height that some suggested was as tall as the Chrysler Building, which apparently was based on a drawing published the day before in The New York Times in a rave review by its architecture critic, Nicolai Ouroussoff. The renderings published in The New York Times and others that could be found on the Internet the next day, and reproduced below, added to the initial confusion as some indicated that the building would have an open crown and the more finished renderings indicated an enclosed, sharply angled top. The source of many of the renderings is www.dezeen.com. The announcement indicated that the "project will likely commence pre-sales in late 2008. Gerald D. Hines, the chairman of Hines, said that "Nouvel's exciting concept has the potential to become an international architectural design icon." Nouvel designed the residential condominium project that was completed in 2007 at 40 Mercer Street in SoHo for Hines and André Balasz. The initial renderings for the project indicated its facade would have some bright red and bright blue windows, but the overall color of the project is something like a bland battleship gray. The project, of course, is notable for its huge windows that slide up and down and a strong Lever House-like modernity whose rectilinearity is not out of place in SoHo. 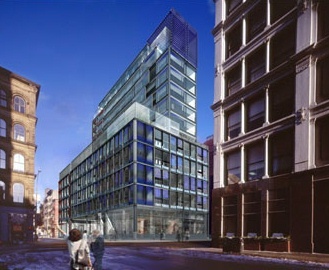 Far more exciting is Nouvel's design for 100 Eleventh Avenue, a residential condominium tower now under construction in Chelsea that is notable for its very faceted fenestration, as shown above. It is directly across from Frank O. Gehry's headquarters building for IAC and the juxtaposition is one of the city's choicest. It is being developed by Alf Naman and Cape Advisors. Both 40 Mercer and 100 Eleventh Avenue have relatively conventional forms in sharp contrast to 53 West 53rd Street whose angularity far outstrips Sir Norman Foster's Hearst Building tower a few blocks away on the southwest corner of Eighth Avenue and 57th Street. The announcement stated that "Nouvel's design maximizes the site while considering the city's zoning envelope," adding that its "unique silhouette tapers as it rises to a distinctive spire" and that "its steel and glass façade reveals the diagrid structural design." The color rendering released with the announcement indicated that the building will have a very complex façade with many diagonal braces, a design that one surfer at skyscraper.com likened to the "the Chicago Hancock Center after being beaten by a blacksmith, hammered and stretched to fit into its site." It was not clear from the announcement if the project was "as-of-right," that is, a development that needs no public approvals and falls within existing zoning and building regulations. The tower will certainly be substantially higher that the Museum Tower, which is 588 feet tall and was designed by Cesar Pelli in an earlier expansion by the museum. The Museum tower is the east of the planned new building, which is just to the west of the American Folk Art Museum. The Museum of Modern Art undertook a major expansion designed by Yoshio Taniguchi in 2004. 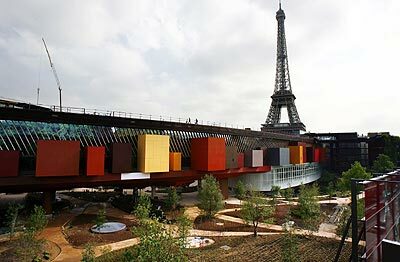 Mr. Nouvel is the architect of the recently completed Quai Branly Museum, the Arab World Institute, the Cartier Foundation in Paris, and the Lyon Opera House. Two of his most interesting designs that were not built called for a hotel projected over the East River in Brooklyn and a tall tower with a bridge to an angled low-rise building in the Meat-Packing District. His first New York City project was a design in 1997 for a "River Hotel" on the Brooklyn riverfront between the Brooklyn and Manhattan Bridges. The cantilevered design was appealing but the unbuilt project threatened to interrupt famous vistas of the two wonderful bridges. Hines built the "Lipstick" office building at 885 Third Avenue that was designed by Philip Johnson, who also designed major skyscrapers for him in many American cities. Hines is also the developer with Aby Rosen of the undulated residential condominium project known as One Jackson Square at 122 Greenwich Avenue that has been designed by William Pedersen of Kohn Pedersen Fox. In a January 3, 2007 article in The New York Times, Carol Vogel observed that the museum's expansion into the Hines tower "opens the way for the museum to address wide criticism of the exhibition spaces in the Taniguchi building," adding that "When the Modern reopened in 2004 many faulted its curators for showing fewer artworks in its expanded galleries than it had before." Hines Interests partnered with Whitehall Street, the Goldman Sachs group in acquiring the site, part of which had previously been occupied by the historic City Athletic Club on West 54th Street. The club closed in 2002 and was acquired by the museum out of bankruptcy. 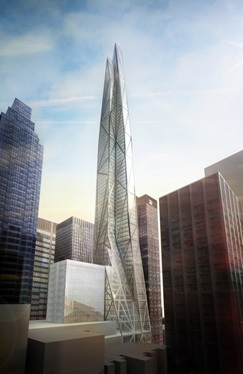 In a review of the new Nouvel tower, architecture critic Nicolai Ouroussoff wrote in the November 15, 2007 edition of The New York Times that it promises to be the most exhilarating addition to the skyline in a generation," adding that "Its faceted exterior, tapering to a series of crystalline peaks, suggests an atavistic preoccupation with celestial heights. It brings to mind John Ruskin's praise for the irrationality of Gothic architecture: "It not only dared, but delighted in, the infringement of every servile principle." Noting that the new tower's facade have "a taut, muscular look," Mr. Ouroussoff maintained that the tower's "contorted forms are a scream for freedom." He also noted that "The top-floor apartment is arranged around such a massive elevator core that its inhabitants will feel pressed up against the glass exterior walls. (Mr. Nouvel compared the apartment to the pied-à-terre at the top of the Eiffel Tower from which Gustave Eiffel used to survey his handiwork below.)" The comparison to the Eiffel Tower may be apt for Nouvel's tower is sculpted structure whose aesthetic is based in large part on its engineering. Unfortunately, it does not stand alone like the Eiffel Tower but it is likely to become a signature element of the midtown skyline. The base of the new tower on 53rd Street rises straight up for a few floors and passersby can look in and down onto museum space. It may not mesh perfectly with the cool minimalism for which the museum is known but it is gutsy and robust and a definite head-turner. Community Board 5 voted 27 to 1 with 2 abstentions and 1 "present not entitled to vote" March 13, 2007, to recommend that the Landmarks Preservation Commission not give a certificate of appropriateness to the transfer of air rights from above St. Thomas Episcopal Church on the northeast corner of Fifth Avenue and 53rd Street and the University Club on the northeast corner of Fifth Avenue and 54th Street to a proposed mixed-use tower designed by Jean Nouvel at 53 West 53rd Street adjacent to the Museum of Modern Art. Hines Interests, one of the nation's foremost developers, had signed a contract to acquire the vacant lot at 53 West 53rd Street from the Museum of Modern Art and provide the museum with about 50,000 square feet of exhibition space and about 10,000 square feet of basement storage space in the proposed tower. As designed by Jean Nouvel, the new tower would utilize the air rights to rise 1,155 feet high, more than a hundred feet taller than the Chrysler Building. Under the proposal, the church, which is located at 678 Fifth Avenue, would transfer about 275,000 square feet of air rights and the club, which is located at 1 West 54th Street, would transfer about 136,000 square feet. The site at 53 West 53rd Street, which extends through the block to 54th Street, can be developed with about 210,000 square feet without any air rights transfers. The plan also calls for about 7,000 square feet of air rights to be transferred from the museum for a grand total of 628,238 square feet if the transfers are allowed. The proposed building, which is to be known as the Tower Verre, would be a dramatic addition to the skyline as it has angled, tapered north and south facades and diagonal bracing. It would contain a 100-room, "seven-star" hotel, and 120 "highest-end residential condominiums." In its resolution sent to Robert Tierney, the chairman of the landmarks commission, the community board noted that the developer "has not provided a written preservation plan and independent Shadow Studies, as requested by the Committee, which are imperative in order to assess if there is an adequate preservation plan in place" and for the commission to report whether "the new tower will 'relate harmoniously to the subject landmark buildings'" including the "stained glass windows of St. Thomas Church which face west to the Development site." The resolution also said that the museum's famous sculpture garden is not a landmark, "but an eventual candidate for Scenic Landmarking, very likely the most adversely affected open space in the vicinity of the proposed tower." The museum recently completed a major redevelopment that was designed by Yoshio Taniguchi. In addition to creating new spaces for the museum to use, the deal is expected to provide it with about $65 million for its endowment. 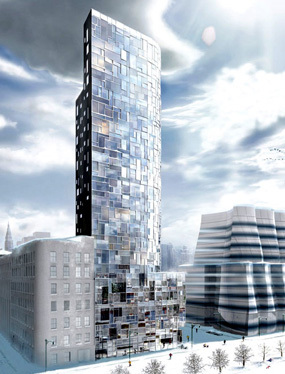 An on-line petition imploring that city officials approve the proposed tower was started at Wirednewyork.com. The petition noted that New York City "has not been at the forefront of skyscraper design for many years now," adding that Nouvel's design "is every bit as great as the Empire State Building and the Chrysler Building, which is no small claim." The Landmarks Preservation Commission held a 3-hour meeting April 8, 2008 on the proposed transfer of air rights from St. Thomas Church on the northwest corner of Fifth Avenue and 53rd Street and the University Club on the northwest corner of Fifth Avenue and 54th Street to a proposed, 1,155-feet-tall, mixed use tower designed by Ateliers Jean Nouvel at 53 West 53rd Street adjacent to the Museum of Modern Art. The planned tower would also use some unused air rights from the Museum of Modern Art and the Museum of American Folk Art, which is adjacent to the site. Most of the speakers at the hearing were residents from the neighborhood and civic organizations that were opposed to the air rights transfers and supportive of a resolution passed 27 to 1 with two abstentions and 1 present not entitled to vote by Community Board 5 March 13 that asked the commission not to recommend the transfers. Jean Nouvel, the French architect who recently was awarded the Pritzker Prize for Architecture, told the commission that his design would "enrich the neighborhood and open the sky to the street," adding that "You can look at the skyline of the city and you can say 'The MoMA is here.'" He said the very narrow building would be open at the top and illuminated at night, describing the design as "élan," which means thrust. Michael Sillerman, a lawyer representing the developer, Hines Interests, told the commission that the proposed tower is about 500 feet away from the church and the club and the project moves bulk away from them and toward the higher density of the Avenue of the Americas. The transfers are being sought under zoning provisions known as 74-711 and 74-79 that permit them if they provide for preservation maintenance programs for the properties transferring them and if the receiving property is "harmonious" with them. A statement submitted by the New York Chapter of the American Institute of Architects said that "we feel that New York City will gain much architecturally from having an example of recent Pritzker Prize winner Jean Nouvel's work so prominently displayed on the skyline," adding that they "feel that the design and materials are 'light' enough that the height is not oppressive and does 'relate harmoniously.'" David Smith of Skidmore, Owings & Merrill, whose projects include the Time Warner Center at Columbus Circle and the Freedom Tower at Ground Zero, spoke in support of the transfers, stating that the proposed tower was "an important project of design excellence." A statement submitted yesterday by the Historic Districts Council maintained that "there is no harmonious relation…between the proposed and the University Club and St. Thomas," adding that "there is really no way a building so tall could do anything but tower over, eclipse and distract from its neighbors." "Both individual landmarks," the statement continued, "are hardly the dilapidated, abandoned buildings 74-711 and 74-79 were created to help." The statement also noted that while the two landmark buildings "are willing to suffer whatever side effects there may be from the construction" it "should be remembered that there are other individual landmarks just across the street that will not enjoy such benefits…as well as many historic, non-designated low and mid-rise buildings, [that] will endure all of the pain, and none of the gain." Christabel Gough, the executive director of the Society for the Architecture of the City, told the commission that "one of the great landmark enigmas of New York has always been the landmark status of the Modern Museum," adding that "if the Modern Museum had been landmarked, even if the area around it, full of distinguished buildings, had become a Modern Museum Historic District, it might be easier to argue that there was a harmonious relationship of some kind, at least historically,…as it is, 'harmonious relationship' seems elusive, and while the University Club and St. Thomas Church as landmarks are entitled to take advantage of their rights under zoning, the likelihood of their falling into disrepair appears remote." Ken Lustbader read a statement from The New York Landmarks Conservancy that stated that "both landmarks are for the most part already in sound, first-class condition," adding that his organization finds "it troubling that a portion of the proposed building will impinge on a City Planning Commission's Special Midtown Preservation Subdistrict that was specifically put in place to restrict over-development on the side streets surrounding MoMA." Lisa Kersavage, director of advocacy and policy for The Municipal Art Society, told the commission that "the design of the proposed building is certainly handsome," but added that "we believe there will be shadow impacts on historic resources, especially on the low-rise landmarks and light-sensitive open spaces like MOMA's sculpture garden." She also said that the area is rich with landmarks "and unprotected landmark-quality buildings" and "there's a sense that we seem to be losing rapidly significant buildings in the area just north of this tower" and urged the commission to "focus energy on designating" such buildings. A statement submitted by State Senator Liz Krueger "strongly" used the commission to deny the applications for the project, which she said "would be grossly out of scale" and "would overwhelm the area's infrastructure and services." The statement said that "the materials, design, scale and location of bulk in the proposed building would not relate to the adjacent landmark buildings." 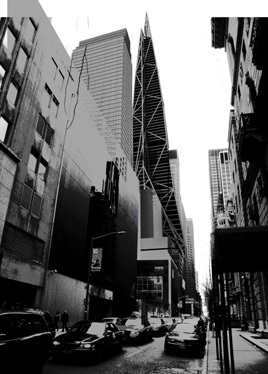 In an article in the April 17, 2008 edition of New York Magazine, Justin Davidson described Nouvel's tower as "an ecstatic reproach to Manhattan's regularity," adding that "It would be to the skyline what Broadway is to the street grid: an indispensable violation and a zagging flourish." 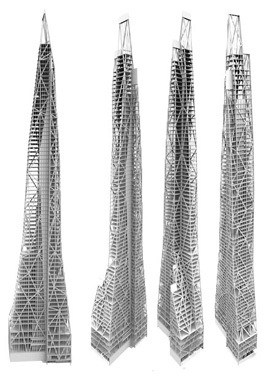 "Its athletic, muscular contortions recall Daniel Libeskind's original concept for 1,776-foot skyscraper at ground zero that would echo the Statue of Liberty's raised arm. No other high-rise in New York reaches its pinnacle with such kinetic precision," according to Mr. Davidson. Mr. Davidson description of Nouvel's tower as muscular is right: it's on steroids and stretches its body to the bursting point. His notion of "indispensable violations" is poetic but stretched too far as the top of Citicorp Center and the Bank of America Building now nearing completion at Bryant Park and Sixth Avenue have sharply angled roofs. 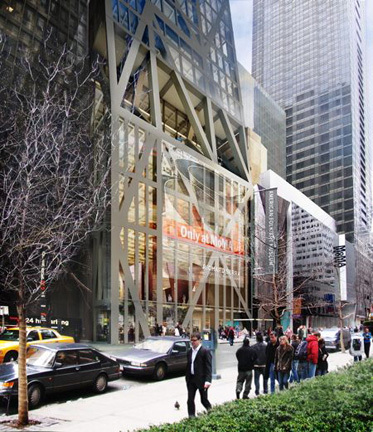 What the Nouvel designs clearly and unequivocally is how horrible and inadequate MoMA's recent expansions have been. It does not solve the problem as it certainly makes no contextual gestures towards it or anything else and probably will still not provide sufficient space for the museum's expansion needs. It is, nevertheless, a grand project, a tour de force. It is one of the hardest proposals to truly visualize and fairly comprehend. Critics are right to suggest that The University Club and St. Thomas Church are not in truly desperate need of the preservation "maintenance program" that the air rights transfers will provide. The bugaboo about shadows has already gone out the barn door since the real perpetrator is Cesar Pelli's Museum Tower that does significantly block afternoon sun from warming the museum's great garden. The Nouvel tower may darken some mid-block buildings on the north side of 54th Street but they are nowhere near as important as the garden. It will be interesting to see what the Landmarks Preservation Commission does with this case since the applicants are so classy and pre-eminent and merely trying to achieve what the laws permit. The Landmarks Preservation Commission voted in May, 2008 to approve by a vote of 7 to 0 applications for the proposed transfer of air rights from St. Thomas Church on the northwest corner of Fifth Avenue and 53rd Street and the University Club on the northwest corner of Fifth Avenue and 54th Street to a proposed, 1,155-feet-tall, mixed use tower designed by Ateliers Jean Nouvel at 53 West 53rd Street adjacent to the Museum of Modern Art. The planned tower would also use unused air rights from the Museum of Modern Art and the Museum of American Folk Art, which is adjacent to the site. Most of the speakers at hearing at the commission last month were residents from the neighborhood and civic organizations that were opposed to the air rights transfers and supportive of a resolution passed Community Board 5 March 13 that asked the commission not to recommend the transfers. The tower would provide MoMA with about 50,000 square feet of exhibition space and about 10,000 square feet of basement storage space in the proposed tower. It would be a dramatic addition to the skyline as it has angled, tapered north and south facades and diagonal bracing. It would contain a 100-room, "seven-star" hotel, and 120 "highest-end residential condominiums" in addition to MoMA expansion.